This review is written by Thomas of Retro Guiden, a leading Swedish Retro Game Blog. Want to write for us? Click here! As a gamer you probably have a few select games that have defined your gaming. Sometimes they have defined a period in your life. Occasionally your whole life. But everybody has at least one game that has defined a whole genre. Phantasy Star is such a game for me and it opened my eyes to Japanese rpg’s. Before PS I had already acquired a fleeting interest in role-playing games. I liked fantasy rpg’s like Dungeons & Dragons but the computer versions I had tried lacked a lot of atmosphere and life. So when Phantasy Star came along it was a real eye opener. It wasn’t just beautiful, it was big and seemed to be alive too. The story is centered around the young girl Alis whose brother is killed by the troops of the corrupt leader Lassic. Eventually she’ll enlist the aid of a warrior, a wizard and a talking cat named Myau. At this period in time it wasn’t exactly common to have a girl as the main protagonist in a role playing game (or any other type of game for that matter) and the success of PS helped pave the way for large female roles in other games. When PS was released in 1988 it was the most expensive game ever released for any console. Furthermore it was one of the biggest games for the Master System console. The early games for Sega’s machine was no more than 32KB in size. In the PS cartridge they managed to squeeze in 16 times as much data and even though the game might be viewed as small by today’s standards, for a long time it was one of the biggest games I had ever played. The graphics are simply superb. Colourful and detailed they represent some of the best that the 8-bit era can offer. PS was one of those games you could show to your Nintendo friends to once and for all prove that the Master System was technically superior. And speaking of graphics, that leads us to the game’s real talking point which are the labyrinthine 3D caves we’ve seen earlier in games such as Wizardry and Dungeon Master. I even remember the Nes title Fester’s Quest trying to do something similar but failed in trying to achieve the same smooth animation that made the jaw drop on anyone who saw Phantasy Star. 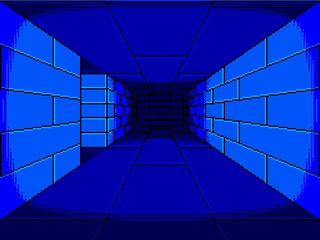 This 3D perspective made the labyrinths in the game easier to navigate and immersed the player on a whole other level than the isometric perspective ever could. One drawback however was the sheer size of some of the caves and the difficulty level that came with each one. For instance, it took me six months to finally navigate through the last big labyrinth in the game. The sound effects in Phantasy Star are strong and a majority of the soundtrack is memorable to say the least. Not that it holds up exceptionally well on its own, but it certainly adds to the special atmosphere in the game. Speaking about sound one should also mention that Phantasy Star was one of few games to take advantage of the special FM-chip from Yamaha. Unfortunately that chip was removed from the Master System console to cut costs when it was released in Europe and North America. As a result the support for the FM sound was removed from the game outside of Japan. 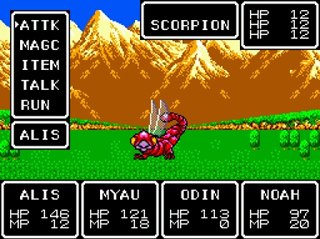 Phantasy Star contains several classic role playing elements. There are several weapons and amours to buy. As you increase the level of your characters through combat you learn different spells and of course there are a lot of random fights when walking across the, for its time, huge world maps. These fights are turn based and relatively easy to get the hang of. You choose if your characters should attack, run away use magic spells or, in rare cases, try to talk your way out of the fight. Despite the fact that you can encounter up to eight enemies per fight (they are always the same type of monster in each fight) you don’t get to choose who you’re going to attack. That’s why you need some random luck in the really tough battles, something players used to different battle systems like in Final Fantasy could get annoyed at. On the negative side there’s a lot of grinding to be done, both for xp and money. It starts right away when you need to level up a couple of times just to be able to walk to the next town or the first cave. As a seasoned veteran when it comes to playing Phantasy Star I have enough patience to put up with it. For the newcomer however, it could be tough to get used to. But if you do I can promise that you are rewarded for your troubles. Because when you have enough money to buy the Landrover or the Hovercraft the game world opens up for real and in the end the exploration will take you across three huge planets. The same goes for the level grinding which makes you gain levels and become more powerful so that you can venture into tougher and bigger caves. So when later rpg’s put a bigger emphasis on story Phantasy Star gives you the freedom of exploring and that shouldn’t be underestimated. If you arm yourself with patience you can get almost as much satisfaction from Phantasy Star as you can get from many of the modern Japanese rpg’s. The story may be a little on the thin side and there’s really no character development to speak about, but when it comes to exploring this game hold up well to its competitors.